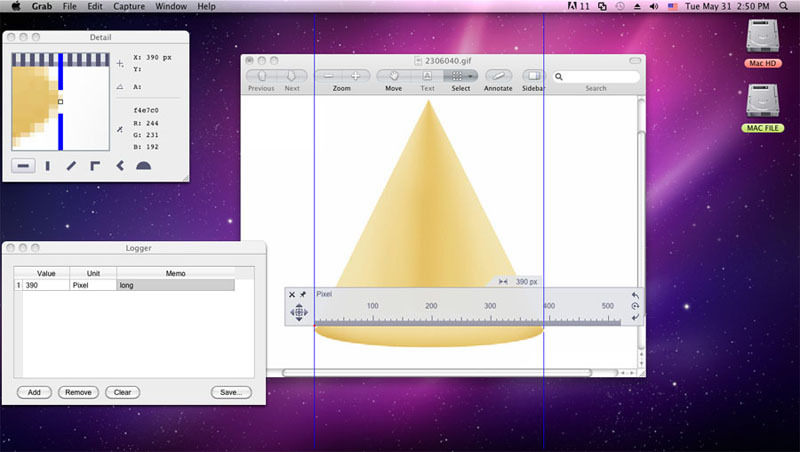 Onde screen rulers for Mac with many intuitive features, enable you to measure objects quickly and precisely on your screen in Pixels, Inches, Picas, Centimeters and multiple customizable units according to your need. It can measure square areas, diagonals and display angles. A horizontal and vertical ruler can be used independently or simultaneously. Diagonal rulers make it easier to measure diagonal objects. In addition, a protractor ruler allows you to measure the angle of an item in angles and radians. Customizable settings of color, transparency, ruler rotation, calibrate length and angle units and keyboard shortcuts are some of the features. It also features a dynamic mouse tracking measurement, precise positioning by a magnifying Detail Window and sight adjustment of direction key control, Logger Window with memo for saving results plus it can float above all other windows. In one word, it is the truly ideal tool for web developers, graphic designers, programmers and etc. Main Futures: *Available Rulers: Switch among horizontal, vertical, diagonal rulers or their groups and protractor rulers quickly and easily. *Measuring Units: Measurement in pixels, inches, picas, centimeters, angles, radians and some other units customized as you need. *Precise Positioning: Magnifying Detail Window and Direction key control are very helpful. Rulers can be located to cursor's location precisely With Detail window for magnifying, *Rulers Adjustment: Direction key control is used for slight adjustment while rulers can be rotated 45 degrees at one time. *Results Recording: Logger Window with memo for saving results. *Memorizing Function: Ruler will show previous condition and location of Detail Window and Logger Window while you open it. *Unlimited Length: Rulers can be extended unlimitedly but always within screen. *Stay on Top: Ability for rulers to float above *Shortcut Settings: Multiple keyboard shortcuts are available to operate the ruler.